US-based PaR Systems has been awarded a significant subcontract to supply the main cranes system to be used inside the New Safe Confinement (NSC) currently being constructed over the wrecked unit 4 of the Chernobyl nuclear power plant in Ukraine. 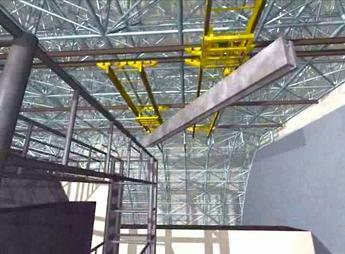 Under the contract, PaR Systems will design, fabricate and test the main cranes system (MCS). The company is also responsible for the site supervision of the crane system erection. The MCS integrates overhead bridge cranes, trolleys, and a remote control and video monitoring system for operating the cranes system in a radioactive area. The MCS will be erected and operated inside the NSC building to allow the dismantling and cleanup of the site in a controlled environment. The MCS includes two 50-tonne trolley hoists that can work in tandem to handle loads up to 100 tonnes. A third trolley suspends a mobile tool platform (MTP), which utilizes a RoboCrane technology that was developed at the US National Institute of Standards and Technology (NIST) and is licensed to PaR Systems. The MTP incorporates a Modular Suspended Manipulator (MSM), developed at NIST in the 1990s, which expands upon the principle of a Stewart platform, a device that uses three sets of paired winches (motor-driven spools of cable) to suspend and manipulate a platform with six degrees of freedom (lateral, longitudinal, vertical, roll, pitch and yaw). Stewart platforms are most familiar for their use as the base of flight simulators. PaR will affix a variety of interchangeable tools to the MSM, including a robotic arm, drill, jackhammer, shear, high-power vacuum system, and closed-circuit television viewing system, all of which will be operated remotely. The French-led Novarka consortium - which includes Bouygyes and Vinci as well as German and Ukrainian companies - was awarded a contract in 2007 to design, construct and commission the NSC at Chernobyl. The NSC is an arch structure that will be erected adjacent to the damaged reactor building (the 'sarcophagus') and then slid into position to environmentally isolate the unit while future cleanup operations continue. The structure is scheduled to be moved over the sarcophagus at the end of 2011 and confine the remains of the plant from the outside world for about 100 years. The environmental restoration work at Chernobyl is funded by 29 donor countries to the Chernobyl Shelter Fund, which is administered by the European Bank for Reconstruction and Development.